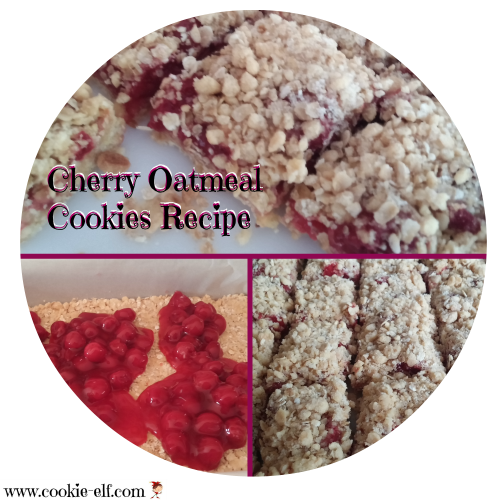 Bar cookies just don’t get any easier than this Cherry Oatmeal Cookies recipe! They are a variation of a fruit crumble – a dessert made popular in Britain during World War II as a money-saving alternative to pie. Fruit (in this case, cherries) was placed on the bottom of the baking pan and covered with a crumbly mixture of butter, flour, and sugar. Sometimes oatmeal or breadcrumbs were added to the crumble mixture to stretch the war’s rationed ingredients. Crumble was popular not only because it was inexpensive but also because it was so simple to make. This easy cake mix cookies recipe takes simplicity one step further by calling for just 4 ingredients. The cookie crumb combination is divided to make a crust on the bottom, fruit placed in the middle, and the remaining crumbles sprinkled on top. Once baked, the dessert is cut into bars. Preheat oven to 375º F. Line a 13 x 9 baking pan with foil or parchment paper. Spray liner lightly with vegetable spray. Set butter in a microwavable dish and cover it with a piece of plastic wrap or waxed paper. Microwave until melted, about 30 – 60 seconds. Meanwhile, combine cake mix and oatmeal into a mixing bowl. Add melted butter to the dry ingredients. Combine with a fork like a pie crust until dry ingredients begin to clump. The mixture will be crumbly. Press half of mixture into the bottom of the prepared pan. Spread the cherry pie filling over the pressed crust. Sprinkle remaining crumb mixture over top of the pie filling, distributing it evenly. Gently press the surface of the crumb mixture down. Bake bars 18-23 minutes until edges of crumbs begin to brown slightly and a toothpick inserted in the center comes out clean. Remove the pan from the oven and allow it to cool completely on a wire rack. Before cutting the Cherry Oatmeal Cookies into bars, set the pan in the refrigerator or freezer for 30 minutes. By chilling the bars first, you will get cleaner cuts. Cut bars into 7 rows of 5 or any other size you choose. Store bars in an airtight container using waxed paper or parchment paper to separate layers. You can use any brand of cake mix in this recipe. You can also substitute blueberry pie filling for cherry pie filling. For cleaner cuts, set the knife in the refrigerator while bars bake and as they cool. Take a look at more easy Bar Cookie Recipes on our Pinterest board.